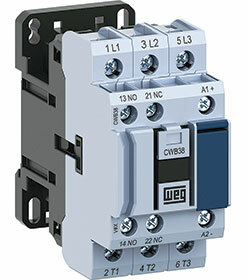 Engineered to provide a compact contactor solution, the WEG CWB range of devices offers a width space saving of up to 18%. Developed in two frame sizes, the contactors meet a range of industrial and domestic application requirements. The first contactor in the range, covering up to 38 A, has a width of only 45 mm while the second contactor, ranging from 40 to 80 A, has a width of 54 mm. Two mounting options, standard DIN rail or oblong mounting holes makes interchangeability easy. Significantly, the space saving allows the use six contactors where previously only five could be used. Another innovative engineering feature is the use of WEG’s Zero-Width mechanical interlocking system. Traditionally contactors use a mechanical interlock device which is external to the contactor. The Zero-Width system facilitates quick and easy mechanical interlocking between contactors, without the need for tools. In addition, this feature allows the user to build a reversing starter up to 38 A with a total width of only 90 mm. Built-in front auxiliary contacts not only enhance the space saving benefit, but also eliminate the need to purchase additional auxiliary contacts. This feature also offers greater flexibility as it facilitates optimisation of the internal space in electrical panels. In another innovation, the contactors have been engineered with integral surge suppressor blocks without increasing the physical size of the devices. This limits undesired interference which could be caused during the opening of the contactor coils and allows for the front mount surge suppressor to be easily removed without the use of special tools. Energy saving is achieved through the low consumption of the coils, which allows direct switching from PLCs without the need for interface relays. This facilitates both space and cost savings for the end-user. Available at competitive pricing from Zest WEG Group’s branches and national distributor network, the WEG CWB range of contactors affords customers a high level of flexibility.